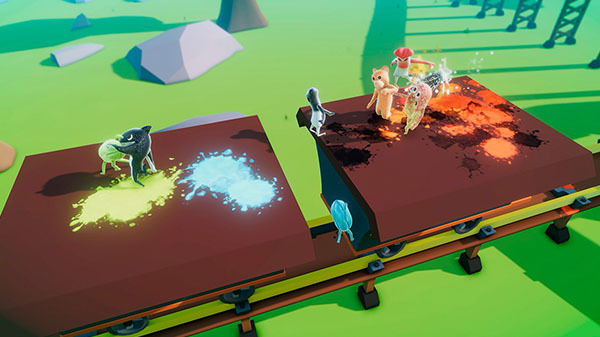 Play as a gummy with up to eight friends. A Gummy’s Life, a party physics fighting game that first launched for PC via Steam Early Access in April 2017, will launch for Switch via the Nintendo eShop on September 25 for $13.49, a launch 10 percent launch discount off its regular $14.99 price point, developer EP Games announced. Multiplayer up to eight players: Play as a gummy with up to eight friends online or in the couch! Easy to play, hard to master: You can sit down, smash all the buttons and have fun or… use the right move in each situation to take your opponents down! Different game modes: Hot Potato, King of the Hill, Team Deathmatch… The fun doesn’t stop on the classic Free for All mode. Tons of levels to play with different game style and mechanics: You’ll find something new in each level. Each one has a different way to be played. Have fun discovering all their secrets! Lots of different gummies to play with: Each of them has slightly different stats. You can choose between many different colors and there are also unlockable gummies! Crazy fights based on physic simulations: Awesome hits and incredible throws. Every fight is genuinely unique. Taunts: Taunt your friends to celebrate your victory… or to make them go after you. For all ages: It’s fun and easy to play for all people. You can even play with your granny!